Sometimes life can feel a little overwhelming, but that’s normal! It’s easy to get caught up in the day-to-day but if you take a step back, you really open up your perspective. There are countless therapeutic activities for adults that can help clear the mind, but here are a few favorites to keep in your back pocket when you need it most. Instead of sitting on that comfy couch buried in your thoughts, try lacing up your sneakers and heading outside. 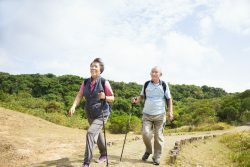 Taking a nature walk can help put things in perspective and reduce the tendency to be hard on yourself and others, according to new research. Breaking up patterned thinking may also be beneficial to boosting your memory and reducing anxiety. When you get stuck in a routine, it can be easy to lose sight of the bigger picture, but sometimes sunshine and singing birds have a way of tuning you back in. As always, ask your physician if this solution is right for you. Ease your mind by giving it something enjoyable to concentrate on. Coloring books have made a huge comeback for adults, both young and old. When you focus on creativity, it can allow other parts of your brain to relax and de-stress. 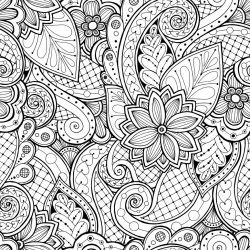 Next time you come home from work, try coloring a page (like the one below) and see how it makes you feel after. If coloring isn’t your thing, try building a model of your favorite car or boat. Similar to coloring, you’ll be focused on a creative task at hand rather than the everyday stresses that can weigh you down. You’ve probably heard of the benefits meditation can have on the body, but it’s not always for everyone. Many people have a hard time silencing their thoughts while trying to focus. If that sounds like you, it may be beneficial to add some movement when you are clearing your mind. Tai Chi is a wonderful way to find peace without having to sit still. Using gentle, flowing movements, this exercise is like meditation in motion. And it’s easy on the joints too! Ask your doctor if you have any medical concerns. If you’ve never given it a try, check out this blog to get started. It’s tough to relax when you’re surrounded by disorganization. A cluttered house leads to a cluttered mind, after all. Luckily, cleaning can actually be therapeutic! Performing mundane tasks can let your mind concentrate on what you’re currently doing, which brings you into the present moment. Take it one step at a time and tackle it room by room. When your home is spotless, the relief and clarity will come flooding in. It feels good to be in an open, organized space. The hardest part is getting started. Next time your mind is feeling a little too crowded, try clearing up some space with your favorite methods. Share what works for you!